Since April 2011 the JinkoSolar plant near the industrial city of Haining failed local Environmental Protection Bureau pollution tests. A further investigation was launched in May, but problems continued. Throughout late August and early September 2011, local residents found a large quantity of dead fish in streams and rivers near the plant. Starting from September 15, 2011, approximately 500 local farmers and residents gathered at the JinkoSolar plant to demand an end to the pollution. Due to lack of information, it is unclear which individuals or groups organized and orchestrated this demonstration. The JinkoSolar plant in Haining is a subsidiary of the Chinese JinkoSolar Holding Company, which is listed on the New York Stock Exchange. The plant manufactured solar panels for sale overseas. Founded in Shangrao in the southern Chinese province of Jiangxi, Jinko Solar is regarded as a star of the clean-energy industry. Four months ago it was named a “CleanTech Driver 2011” by Germany’s Deutsches CleanTech Institut. But its environmental performance is less worthy of praise: local-authority tests carried out on river water near the Haining facility found fluoride levels 10 times above permitted standards. This incident is no anomaly. Energy use and pollution at polysilicon refineries further up the industrial chain are even more extreme, while the large amounts of hydrofluoric acid used at solar-panel manufacturers result in large quantities of fluoride waste. Industry insiders say that rivers near solar-panel factories frequently show fluoride levels at least 10 times above mandated levels, sometimes as much as 100 times or more. The township of Yuanhua lies 20 kilometres from Haining city, and is home to many solar companies. But Zhejiang Jinko is the only solar-panel manufacturer; the rest are in the solar water heater business. After a heavy downpour on August 24, large numbers of dead fish were found in the Mujiaqiao River. This is the nearest waterway to the Zhejiang Jinko facility, and although it is less than 10-metres wide, it is part of a network of many other rivers and lakes. 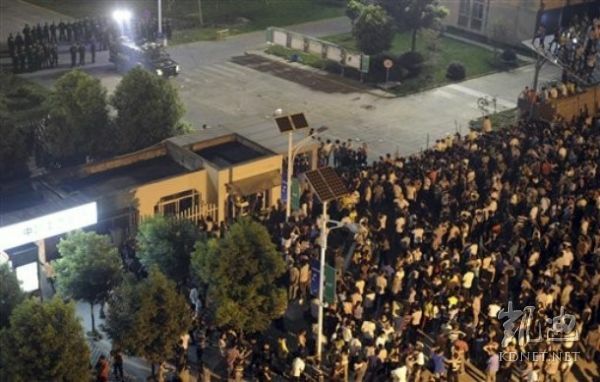 On the evening of September 15, and after a number of exchanges between Zhejiang Jinko and the local government failed to produce a result, over 500 protesters gathered in front of the factory gates to demand an explanation for the pollution. Two days later, large numbers of villagers were still protesting. According to Haining Public Security Bureau, several hundred members of the public demonstrated about environmental pollution in front of Zhejiang Jinko on the evenings of September 15, 16 and 17, with some throwing bricks and stones at police and security guards and overturning eight private vehicles and four police cars. At least 20 people were detained on criminal or administrative charges. Hongxiao’s pollution problems are now well known in the wider area. One villager said that when they go to the township to sell vegetables, they don’t tell people where they’re from. The locals here used to use well water, but now they don’t dare to drink it, or to eat local rice. One villager said that many students at Yuanhua Central Elementary School, very near to Zhejiang Jinko, want to change schools. “Everyone’s just really worried.” On September 8, a villager surnamed Sun, writing online, claimed that health checks carried out at the end of August had found six cases of leukaemia and 31 cases of cancer among the 3,300 villagers. The Haining Health Bureau rejected these figures, saying that in the three years from 2009, only eight, four and two villagers had suffered malignant tumours respectively. Sun has been detained by local public security and charged with “spreading false rumors”. On September 17, production at Jinko Solar was stopped to allow environmental-protection equipment to be upgraded. “If we’d known this would happen, we wouldn’t have kept producing at the time,” said Jing. On September 19, Jinko Solar held a press conference in Haining to apologize for the “clash with reporters” and “improper handling of waste”. Board secretary Jing Zhaohui said that, on September 16, improper behaviour of security staff and poor communication led to cameras belonging to Zhejiang TV reporters getting damaged. Jing also said that Jinko’s chief executive had visited the TV station to apologize, and that those involved had been reported to the authorities, while the employees responsible had been fired. He added that preliminary investigations had found the pollution may have been due to improper storage of solid fluoride waste, which allowed fluorides to be carried by rainwater into the river. However, Jing stressed that this was only a hypothesis, and that there was still no hard evidence to show a direct link between that improper storage of solid fluoride waste and the dead fish, and that an investigation by the environmental authorities was necessary. 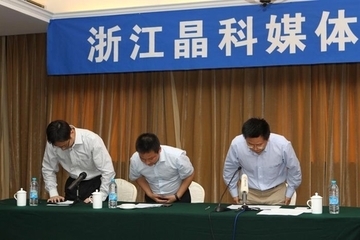 The company’s apology was, then, for the clash with reporters and improper storage, and not for the pollution. -2012 Sponsorship of Valencia C. F.
Why? Explain briefly. It was halted temporarily due to the protests, however, solar PV is a large industry in this area and the company continues to operate anyway, there are also many other similar companies around.